Hungover from Christmas? Well we have two movies that feel like a hangover (and not THE HANGOVER which one of these films hoped for) in our latest offering during the holiday season. 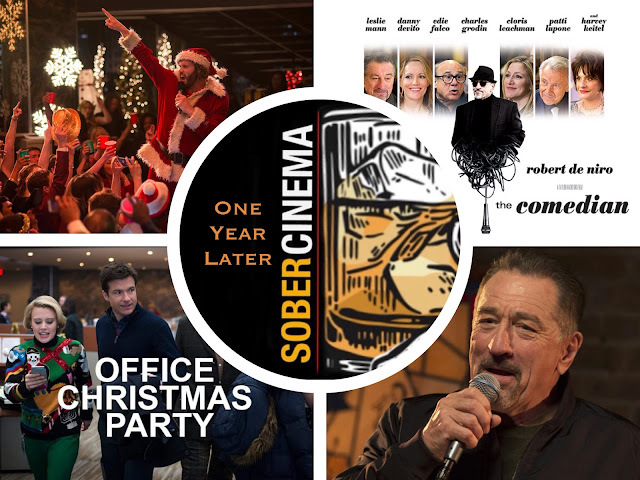 On December 9, 2016 two films focusing on the combustible combination of comedy and careers arrived like a lump of coal: OFFICE CHRISTMAS PARTY got a wide release and achieved modest box office success, while THE COMEDIAN starring Robert De Niro premiered in limited release in pursuit of Oscar glory. It is not a spoiler to say that neither film presented on this podcast won any Academy Awards. Which puts these films in the appropriate company of your hosts of SOBER CINEMA! Enjoy(ish).